The classic pumpkin cake mold from Martha by Mail makes a great cake for any occasion during the fall season. Using warm spices and delicious pumpkin puree, the recipe given to us by the editors at Martha Stewart Living, is perfect for a Halloween party or for Thanksgiving. You could also make one if someone is celebrating a birthday in the coming weeks or if you want to have a nibble for your pumpkin carving gathering. With two halves "glued together" with a rich butter glaze, you can easily recreate the jack-o'-lantern cake found on the original recipe card, or you can leave a perfectly glazed cake, plain and simple, like the ones that graced a few of the past issues from the former catalog. If you're fortunate enough to have this mold or one similar to it, bake and ice a cake in the shape of a pumpkin sometime soon, because people are going to devour the spooky, fun cake in no time at all. "The tradition of molded cakes derives from the ancient Middle-Eastern custom of stamping symbolic designs on holy bread. By the 17th century, Western bakers used special molds to create shaped cakes for holidays. This durable cast-aluminum mold produces a cake in the shape of a pumpkin, ideal for serving at Halloween. Please note that the two sides of the pumpkin mold are designed asymmetrically so that the cake will have a realistic appearance. Before using the mold, hand wash in warm soapy water and hand dry; clean the same way after using." This photograph shows a plain pumpkin cake sitting atop a white, milk glass cake stand. The heavy cast-aluminum cake mold, now a collectible, has handles on each side and four feet per half, to hold it steady while baking. These were made in the U.S.A.
Another pumpkin cake is given a scattering of fall-colored marzipan leaves and a generous sprinkling of sanding sugar. 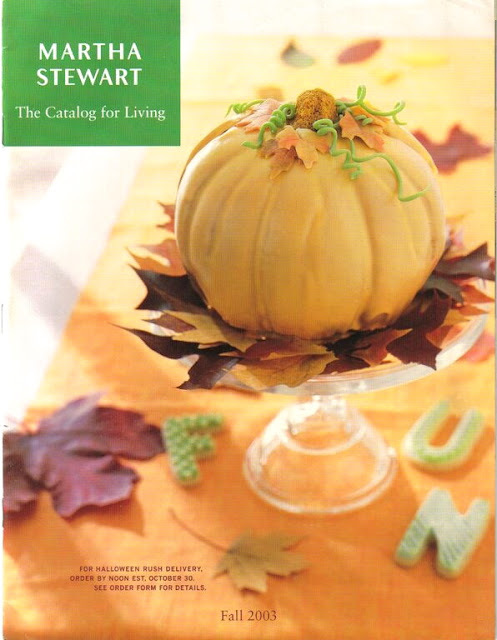 This glazed pumpkin cake graced the cover of the fall 2003 Catalog for Living. Preheat oven to 350°. Using a pastry brush, generously butter the mold. Dust with flour, and tap out the excess; set aside. In a large bowl, sift the together the flour, cinnamon, nutmeg, allspice, salt, baking powder, and baking soda; set aside. In the bowl of an electric mixer fitted with the paddle attachment, beat together butter and 3-2/3 cups sugar on medium-high speed until light and fluffy, about 4 minutes. Add pumpkin puree and milk, and beat on low speed until combined. Add reserved flour mixture, and beat on medium-low speed until just combined; set aside. Using the whisk attachment, beat egg whites on low speed until foamy. Slowly add the remaining 1/3 cup sugar, and gradually increase to medium-high speed, beating until stiff peaks form. Using a rubber spatula, fold 1/3 of the egg whites into the batter to lighten. Gently fold in the remaining egg whites until well combined and smooth. Pour half of the batter into each mold, to within 1 inch from the top. Using a small spatula or spoon, spread batter into the stem area to fill completely. Transfer molds to a baking sheet, and bake until the top sets and begins to brown, about 45 minutes. Rotate pan halfway, and reduce oven temperature to 325°. Bake until a wooden skewer inserted into the center comes out clean, about 45 minutes. If cake begins to get too dark, loosely cover the molds with aluminum foil. Remove from oven, transfer to a wire rack, and let stand for 20 minutes. Using a serrated knife, trip cakes flush with top of the molds, and invert cakes onto a cooling rack, trimmed side down, until completely cool. Place in refrigerator for at least 1 hour or overnight. In a medium bowl, whisk together 6 cups sugar and butter. Add milk, a little at a time and continue whisking until the glaze is completely combined and smooth. Transfer 1/2 cup of the glaze to a small bowl and refrigerate. Tint the remaining glaze with 1/4 to 1/2 teaspoon orange and 3 drops brown paste food coloring. Stir the remaining 2 tablespoons confectioners sugar into the reserved glaze. Divide glaze in half, and using yellow paste food coloring, tint one half a pale yellow, and the other half a brighter yellow; keep covered until ready to decorate the cake. In addition to the Pumpkin Cake and Butter Glaze, you will need a utility or paring knife, serrated knife, small offset spatula, long wide spatula, wire rack, parchment paper, 3 pastry bags with #2 round tips, and a wooden skewer. For the stem, you will need marzipan or almond paste (3 ounces), and paste food coloring in moss green. For spiders, you will need 2 tablespoons cocoa powder, 1/4 cup excess glaze and 1 teaspoon milk. While the cake is baking, make pumpkin's stem. Tint marzipan very lightly with the moss green paste food coloring. Remove 1/4 of the marzipan, and tint it darker green, using 1/8 teaspoon moss green paste food coloring. Roll darker green marzipan into a 1/2 inch-thick rope. Add the rope to the lighter piece of marzipan, and fold and twist the colors to just start to incorporate. This will give the stem a swirled effect. Shape marzipan into pumpkin stem, making the base hollow to fit over the cake stem. Add texture with a utility or paring knife. Cover with plastic wrap, and set aside. To assemble the cake, carefully, trim the base and sides of the two chilled cake halves level using serrated knife. Make sure the trimmed halves fit together flush. Using an offset spatula, spread 2 tablespoons orange butter glaze over each trimmed side (use a total of 4 tablespoons glaze). Gently press halves together, and refrigerate for at least 1 hour. Using a wide spatula, transfer the pumpkin cake to a wire rack set in a rimmed baking pan lined with parchment paper. Reheat orange butter glaze to consistency just thinner than honey (100°), making sure it is completely smooth. If it begins to separate, reheat and whisk again until smooth. Pour or spoon glaze over the entire cake, guiding the glaze at the bottom with the offset spatula. Carefully press marzipan stem over the cake stem and refrigerate 30 minutes. Reserve 1/4 cup of the excess glaze for spiders (optional). Transfer yellow glazes into separate pastry bags, each fitted with a #2 round tip. Using a utility or paring knife, cut jack-o'-lantern face onto one side of the cake, about 3/4 inch deep. Carefully remove the cut-out cake pieces. Pipe darker-yellow glaze on the inside of the cut-out face. Pipe the lighter-yellow glaze along the trimmed edges. Using a wooden skewer, gently press against the lighter glaze, and then pull out. Repeat at slight intervals to create zigzag lines for a realistic "carved" look (shown above). For the spiders, stir together cocoa powder and reserved 1/4 cup glaze until combined. Add 1/2 to 1 teaspoon milk to thin the glaze. Spoon glaze into a pastry bag fitted with a #2 round tip. Pipe a trail of spiders along one side of cake, if desired.